Groups must pay 50% of the total amount in advance and the remainder when you arrive. Two weeks notice of cancellation must be given to receive a refund. In addition of the 10% deposit requested for hostelworld, a 40% of the total payment must be required for the group reservation. Please contact info@hoteldelperegrino.com. Once a colonial house, Hotel Del Peregrino has been completely remodeled in the traditional Yucatan style, featuring high ceilings and restored mosaic tiles. 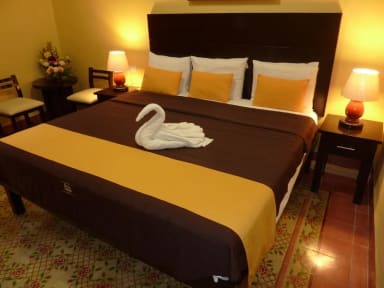 All of our lovely rooms come with mini-split air conditioning, ceiling fan, 21 cable television, free WIFI, security box, off-site swimming pool, guest computer, relaxing four person Jacuzzi located on our beautiful terrace and much more. Hotel Del Peregrino is just steps from city attractions such as La Plaza Grande, the Governor's Palace and the Saint Idelfonso Cathedral. The hotel's own travel agency can help arrange tours to nearby archaeological sites and cities. Before exploring the area, guests can enjoy a complimentary complete breakfast on our central patio. Guests can also take advantage of the hotel's available kitchen to prepare lunch or dinner, and then enjoy a refreshing drink in the Palapa Bar.